Recently released figures from the Global Wind Energy Council show that China doubled it's installed wind power capacity in 2008, reaching 12.2 gW, up from 6.3 gW. This is obviously huge growth and very important progress, but China still has a lot of work. 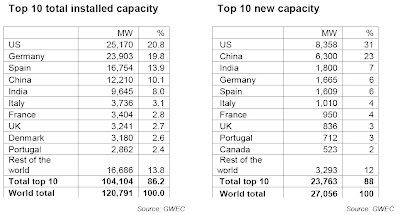 The US also passed Germany to become the world leader in installed wind capacity, with 25.2 gW. Xinhua reports that China will begin to offer subsidies for 13 big municipalities (Beijing, Shanghai, etc) to purchase advanced fuel buses, taxis, dumptrucks and postal cars. The details aren't yet clear, but the subsidies would help cities fund purchases of fuel-efficient hybrids and electric and fuel cell vehicles. This could be a big boon for BYD, SAIC and the other Chinese automakers charging into next generation fuel vehicles. The highest levels for small cars were set at CNY 50,000 (USD 7,300) for a hybrid car, CNY 60,000 (USD 8,760) for an electric and CNY 250,000 (USD 36,500) for a fuel cell car. Buyers for large buses will get much higher subsidies, with CNY 420,000 (USD 36,500) for a hybrid, CNY 500,000 (USD 73,000) for an electric and CNY 600,000 for a fuel cell buses. This subsidy really matters: the subsidy for electric cars will bring BYD's autos well within cost competitive range with normal internal combustion engine-powered cars. See my previous post on electric car economics. As Climate Progress notes, China faced a serious wake up call recently showing how important it is to move to clean energy now. First, local pollution is hurting China's children. A BBC article reports that birth defects are on the rise, and a senior family planning official blames pollution related to coal. Birth defects have been most severe in coal heavy areas. In order to alleviate both local pollution and global warming, China needs to move away from coal now. Against the backdrop of the worsening global warming-related problems described above, US Sec of State Hillary Clinton will make her first international trip to Asia, with a trip to China to discuss climate change, reports dotEarth. This very well could be the international issue of Obama's presidency. Several reports also came out with advice for US-China climate change negotiations: Brookings Institution and Pew Center for Clim/ Asia Society.